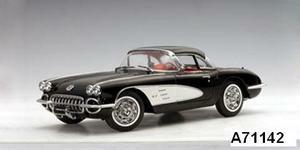 1959 Chevrolet Corvette Black 1/18th Scale by AUTOart, $299.99 at Modena Motors Inc.
Only 6000 made world-wide and stunningly detailed. features removable hard top also. Tuxedo Black gleaming paint and a must have for any Corvette collection. LAST ONE!! !